There are certain recipes which always remain our favorites and we can never be tired of cooking them over and over again. One such favorite recipe that I cook often and is enjoyed by my family and friends is the Spicy Chicken Masala Curry. Its better than any restaurant recipe. This chicken curry recipe is not a fancy one, very simple, straightforward and quick to make. I donâ€™t remember the recipe source, its been there in my recipe files since ages, thought I’d share it. There are endless variations to the chicken curry and today’s chicken curry is prepared with the same basic ingredients as any normal chicken curry, the only other major ingredient is cashewnut paste. The spice level of the curry is high due to the use of black pepper and chilli powder. But the blending of cashewnut paste with the spices offsets the spicy flavor of the curry and gives this dish its unmistakable, not-too-rich, subtly sweet, warm and spicy flavor. 1 Marinate chicken pieces in chilli powder, turmeric powder, curds and salt for 20 mts. 2 While the chicken pieces are marinating, make a paste of cashewnuts and milk. Keep aside. 3 Dry roast cinnamon, cloves and curry leaves for 1 mt and make a powder of them. Keep aside. 4 Heat 1 1/2 tbsps of oil in a cooking vessel. Add the onions and saute till pink. Add ginger-garlic paste and saute further for another 3-4 minutes on medium heat. 5 Add coriander pwd, cumin pwd, pepper pwd and combine well and fry for another minute. 6 Add the tomatoes and let it cook for 3-4 minutes. Combine well and cook till oil separates.Turn off heat. Cool and grind the cooked masala. Keep aside this masala paste. 7 Heat 1 1/2 tbsps oil in a cooking vessel and add the marinated chicken and cook on high flame for 4-5 minutes, reduce heat and cook covered for another 4-5 minutes. 8 Add the ground masala paste, cashewnut paste and ground powder of cinnamon, cloves and curry leaves and combine well. (Add a cup of water for more gravy consistency). Cook till chicken pieces are soft and you get the desired curry consistency. Adjust salt. 9 Garnish with fresh coriander leaves. Your blog and the photos are gorgeous!!! I love chicken masala, thanks for the recipe and your advise on variations (I don’t get curry leaves here). I’m going to try it and let you know how mine turns out. Another question I’m afraid I have to ask you here (sorry I just can’t get to your Jihva’s post)… Is green pea classified as lentil? I want to use it to join the event. Thanks in advance. Thank you for your kind words on my blog, Gattina. To answer your question, yes, you can use green pea ..
all legumes and pulses are allowed for JFI- Dal event. Sailu, the picture looks so tempting. Good one :). Hee Sailu really pictures are very good….immediately am feeling to eat..
or you prepared and took photo..
Wow, the photo is really amazing. Very professional. Thanks for sharing. 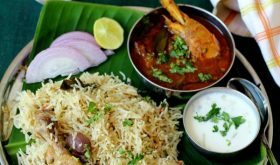 I am a regular visitor to your blog, I love your food, I am from hyd, but a north indian, born and brought up in Hyderabad, I love spicy andhra food. I love chicken, I cook it quite often, my DH also loves it a lot, your recipe looks quite tempting, I am going to try this for sure. Thank you for dropping by and your kind words on my blog, Radha. Priya, do try it and let me know how it turned out. Lovely recipe and pictures…..perfect for a dinner ,this weekend ! SAILU SUPER . STILL LEARNING HOW TO MAKE ANOTHER DELICIOUS RECIPE. Wow, your photos are awesome, just awesome, I could taste the curry just by looking at it. Once again a great recipe there. How do you manage to take such wonderful pictures ? I have recently tasted chicken and your recipe is motivating me to try cooking a chicken dish myself and eat it again. Kudos to your post! Still learning how to use the digi cam I have, Nav. You will love this chicken curry for sure. Incredible photos! I would really love to try your recipe, where would I get some curds or what would I susbstiture if I cannot find them? then replace it with 2 tbsps of lemon juice. Sailu: Gorgeous pictures and yummy recipes. They looks perfect and your pictures are peaking day-by-day :). I am going to have guests tomm evening and definitely going to try making this. Let you know how it turned out. Thanks for sharing this recipe. A beautiful picture of the chicken masala!Good one Sailu! Hope you like the chicken curry, Sudha. Hi Sailu ,another perfect yummy dish from ur kitchen ur family is so lucky to have a excellent cook. In my next trip to India I should surely plan for some classes from u:) ..mee snaps chustunte avi snaps kadu asalu dish akkada petinatu untundi. ur pics are getting better day by day sailu..
I’ve made this chicken masala, it is increditably delicious!!! I can’t believe I’m able to make such a fantastic Indian dish, all because of your great recipe (and very clear instruction)! Thank you so much, Sailu! But your dish looks really nice, especially that beautiful red oil on the gravy, I don’t know why I can’t get that red oil in mine… can you please advise? give that red color. I dont buy the ready made store bought chilli pwd. I sun-dry the dry red chillis and then grind them to a fine powder. to branded ones. That has been my experience. Lovely dish…Andhra chicken…Wow!…feel like flying back to India…that’s a very gorgeous snap. This is one of my favorite Indian recipe… I tried it last year in Little India in S’pore and I loved it. I am now making it using the recipe I got from an Indian taxi driver… a very nice and funny guy. I will try your version too. Thanks. Thanks for explaining the details. I ground my own spice except the chilli, glad that you told me more about it! My knowledge on Indian cusine is extremely skin-deep, I’m so lucky having you here to teach me. Your site is absolutely informative, inspiring, and beautiful! Finally, thanks again for telling me more about JIHVA – lentils. I think Indian (and a few asian) cusine is excellent! I hope many of us while are so busy in making western dishes, still please don’t forget this Oriental gem 🙂 My husband has already asked me when he can have this dish again! Awesome !!! !….I made this dish for my parents and they liked it so much….Thanks for sharing .. I do the chicken curry as same but I add kasoori methi to bring aromatic flavor. It’s awesome. This is second time I made this curry and it’s realy too good. Are you a master chef or house wife? Very chilling photo of chicken. I have made this recipe 3 times, and each time it turned out delicious. Thanks for sharing your recipe. Thank you very much for this recipe i tried it and it was truly fantastic. As with another comment i could not get the same red colour. I grow my own chillis (cayenne) and grind them but the resulting powder is very pale. I need to find seeds for Kashmiri red chillis but so far have not been able to find them in the regular seed catalogues i use. Do you know where i might find seeds. I moved to France from England and really miss spicy food so we make it at home as much as possible, many of the seasonings are not easily available in France so we grow them. Hi! this is Rg. I’m visiting your site for the second time but this is my first comment. Your Chicken masala is absolutely gorgeous and mouth-watering. I’m sure going to give this curry a try this weekend. Will let you know how it turned out. Thanks for sharing this awesome recipe. i m happy with the recipe given n it even looks very delicious. But I have a doubt. How can the chicken pieces be cooked without adding water…. Dhanalakshmi, the chicken pieces will leave water during the cooking process and will be cooked till soft in its own water. Looks very delicious !!! I want to how u powder clove, cinnomon and curry leaves (kadipatta) right. The curry leaves should be fresh or i have to use dried ones. Or once it is roasted it becomes dry. Jasmine, once the fresh curry leaves are roasted along with the other spices, its becomes crisp and can be easily powdered. I did try ur Spicy chicken curry yday, but it dod not turn out like ur picture, the curry became very thick & creamy no matter how much water I added, also did not taste so great, can you tell me why ? Thanks, Aruna. chicken tikka masala curry is absolutely fantasticaly delicious…. It’s amazing to c the pics. it looks mouthwatering!!!!! !, will soon try this recipe. i”ll surprise my husband by cooking dis recipe on sunday. thank u so much!!!!!! looking forward 4 more recipes! I am not into cooking but i wanted to make a chicken dish for the holiday so my mother could rest for a while. so i browsed and found your recepie. i made it and it came well as you have displayed . I shoud say it tasted beautiful,though it took some time for me to do it because of my inexperience in cooking. please do post more receipe …. tasty ones, Keep up the good work. thank you very much. I tried this dish and I have to tell you …. it is awesome!!! Thanks so much for sharing your recepie. I love the fact that all the ingredients in your recepies are already there in most of the Indian kitchens. I am going to try your tomato dosa this week. Will let you know how it comes out. Just like to confirm with u the curds – is it yogurt? Thanks! I tried your Chicken masala curry yesterday and it came out really good.. I added less cinnamon and cloves and more chilli powder and it was fantastic.. Also, I tried ur Capsicum rice too which came out good..thanks for all the recipes.. This recipe is awesome. This was the best chicken i prepared/had in my life till date. My friends too were licking their fingers and plates in the end. This is a jewel in the crown of Andhra food. Hats off to Hyderabad. I found this recipe by typing “chicken curry leaves” into Google and I’m so glad I did! We cooked it tonight, and man was this tasty! Most of the “Indian food” I try to make comes out… um, somehow Italian?? Not this. I’m really glad I wandered into an Indian store today and finally bought curry leaves for the first time. The authentic taste was well worth the extra effort. Thanks a million, Sailu. I will be cooking this again for certain. Nice recipe, I am going to try it now. I have been trying to cook a decent biryani for my wife for a long time without any success, until now. My mother gave me the recipe and Boy, was it good? It was very simple as well. Do you guys want to try it. Let me know and I shall share it. Thanks once again. Sure, Peter, go ahead and share the recipe with us. Lamb – 500 to 750 gms, Onions-4 medium sized, Tomatoes- 2 to 3 small sized, 2 tsp Fresh Ginger Grlic paste,2 tsp Lime juice,1 cup Yogurt,Mint Leaves, Coriander Leaves, Cinamon, Cloves, Cardamom, 2 tsp Chilli powder, 2 tsp Dhanya powder. Before you start soak rice in water for about 30 mins. Grind Cinamon Cloves and Cardamom into a fine powder. Use a heavy bottomed vessel to cook the lamb. Fry chopped onions in 3-4 tsp oil until golden brown. Add ginger garlic paste and fry for about 2 mins. Now add the Lamb and some salt(to your taste) and fry for about 10 mins. Separate the oil from the meat and keep it aside. We are going to use the same oil again later. Now add the chopped tomatoes,yoghurt,lime juice, chilli powder,dhanya powder and the ground spices(cinamon,cloves and cardamom). Add a cup of water and cover with a tight lid. Fry well for some time. In the meanwhile, add a tsp oil and some salt to the soaked rice and boil it in a different vessel and half cook the rice. Strain the water from the rice and then add it to the meat. DO NOT MIX IT, JUST COVER THE COOKED LAMB WITH THE RICE( The meat at the bottom and the rice on top of it.) Now pour the oil that we separated from the meat earlier over the rice and cover it tightly with a lid and cook it in a very low flame for about 45 mins to 1 hr. Forgot to add, mix the rice with meat when it is still hot and you are done. Now another thing I forgot, You got to add the mint after frying the ginger garlic paste. Sorry Sailu, my memory is really poor. I forgot to mention it. I look like a fool now. Dear Sailu, I tried this recipe tonight, and we enjoyed it. Thank you for posting it. the dish looks really tempting. first time peeping into your site. happy that i have been to a good cookery site. I would like to make your chicken masala, but I do not know what you mean by “curds”. What is this? 3 tbsp of curds. Curds of what? Please advise. Thank You. Substitute it with yogurt, Amy. Spicy chicken masala curry which I tried this weekend was just mouth watering. I saw the recipe in your website with the image so I just happened to give it a go and it was liked by all. I will surely try some more recipes. If you do conduct any cooking classes I would like to attend. Thanks. Awesome receipe..i just tried today and came our perfec! Delicious!! Next time i will cook when theres a family function. thanks Sailu the spicy chicken masala is so yummy. I tried you chicken curry and it was awesome! My husband loved it too! Thank you very much for the recipe. I have never been able to make a delicious curry without ready made garam masala before this. This is a great recipe. Grinding the onion, tomato masala after frying is really a great idea cause grinding the onions and tomatoes and then frying them takes too much time and requires more oil. Thanks again. 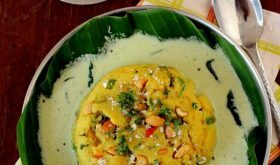 This is really delicious, I tried once though with a little variation of adding cashews and pudina while cooking and it came out so yummy that ‘m going to prepare this again. Thank you so much for a mouth watering recipe. I have tried and tasted your masala chicken recepie. I have just one word for you-simplicity at its best. Thats actually four words. Keep up the good work sailu. Hello Sailu, I’m from the philippines and I need your help. I have a research paper about “Chicken Masala Spicy” and I need some description about it. I hope you can help me. Thanks and more power to you. God Bless. Sure, Nisa, I’d like to help you. Can you email me at sailusfood@gmail.com? I tried this recipe yesterday. It came out well. Its very tasty. I was out of curry leaves so i tried without it. But its delicious. Your pictures are very tempting and nice. I tried ur chetinad chicken. Its very good too. ok.I’ll try. I also have a problem of Garam Masala suppliers bcuz there here are only few sellers here in the phils.that are selling Garam Masala powder.What should I do?I’ll try to go in your email now. tnx and God Bless. Fortunately landed on your blog… and tried this Spicy Chicken Curry !!!! It turned out really fantafab.. This site has copied this chicken curry pic of yours Sailu. Thanks for informing me, Sumitha. hi sailu..can u tell me the calories in this dish..?plz..
I’m not sure. I guess, one serving would be above 400 calories since it is rich. I saw your recipe today by chance. I will definitely try it and let you know the outcome. Was in Delhi, Agra, Jaipur and Mumbai in 2006. Just loved the food there. Tasted a few versions of lamb masala etc and naan and my friends who were with me went ga ga over indian food. By the way u mentioned u grind spices, I do that too, however mine is not so fine. Do you use some special kind of grinder, I use the normal panasonic dry grinder. Mandy, I live in India and I use Sumeet Grinder, the most popular brand here. Recently i saw ur website with nice pictures… I tried this recipe .. it came out very well….. only thing is the red color ….. i didnot get that red color …. but it tastes good …. can u plz explain me how u got that …. Thanks for this beautiful site….. It depends on the type red chillis/chilli pwd one uses, Kalyani. There is no replacement for curry leaf and please don’t use curry powder in its place. Hai Sailu, Your presentation gives us temptation!!!! This is a mouth watering dish. so simple preparation but so good in taste. Hello, i am just a little tiny bit concerned that this is a curry masala and how come we dont use garam masala? My wife has really relished this recipe and has fallen in love with my cooking. I had won her heart 20 yrs back and now her stomach. THANKS!!! My wife has really ralished this recipe and has fallen in love with my cooking.I had won her heart 20 yrs. back and now her stomach. THANKS!!! back to this site after a long time. whats the difference between yogurt and curd. can you suggest some snacks for my five year old son for his school. I’m doing good and hope the same with you. Yogurt and curd mean the same, Mahi. I hope to blog some lunch box recipes and you could check ‘snacks’ category in the side bar. Looking at the photo, any one would want it to taste and so would i, but do not know how to prepare it. Well i will try it after some time then i will tell you how it tasted. thank u for nice photo and nice recipe. God bless you for sharing your goodness & talant. 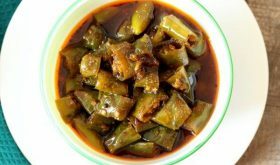 your dosa avakai pickle. It was delicious. & hope to give him a surprise.The picture looks so good. Keep up your good work of sharing & may god always bless you with a good, happy, peaceful & prosperous life. I have never tried making an Non veg curries till now. Everytime my mom cooks and i only eat 🙂 I wanted to surprise her today so was searching on net and found your recipe. Thank you so much. It came out very well and very tasty. Your recipe calls for 1″ (the symbol for ‘inch’) cinnamon. I’d love to make this recipe but don’t know what measure you mean by (“). Bryan, just use a small piece which is one-fourth size of your little finger. It can be a little less than 1″ inch also but too much of cinnamon is not good for the recipe. Hope this helps. This is an amazing receipe…i liked it …its easy and very very tasty. this is an amazing recipe.. slightly similar to the one I learnt from my friend’s mom.. and guess the cashew bit wud lend the curry simply delicious..
the recipe and the snap looks great. surely i’ll try it this weekend. Sailu can u give the recipe of perfect hyderabad chicken biryani and for the masala also. Hi! I’m from Houston, Texas. Wow!the picture looks soo yummy. I’ve always added coconut milk or grated coconut to get that consistency. But, high fat content in coconut always bothers me. I’ll try ur recipe and let u know how it turned out. Like I promised, I did try out this dish. It turned out to be too good. My husband just loved it and so did my daughter. Thanks. I stumbled on this recipe and I am in the moments of putting the finishing touches on it. Never tried making a curry from scratch but I’m very eager to see how it turns out! Thanks for the recipe – the directions are very straightforward and insightful. Your website is totally awesome!!! Just tried this receipe and it came out pretty good. I was cooking chicken for the first time and followed the directions to the T. Keep up the good work. Very good, the photo is really amazing. Very professional. Thanks for sharing. Hi Sailu, I’m 19, my mom is away in India but I wanted chicken curry so I had to make some myself today using your recipe. The curry turned out tasting just like mom’s but with a much creamier texture. I’m very happy with it! We’ve never ground the masala mixture when cooking before but I like how it makes the curry turn out. I think next time I’ll even double the masala mixture to make more of the delicious gravy. I just cooked this. I swear mine doesn’t look anything like in the photo on this page. haha. Thanks a ton for this wonderful recipe! I tried it tonight and it came out absolutely fabulous…my husband loved it! This chicken recipe is one of the best I ‘ve tried. It tasted awesome and I felt like at home while eating it thousands of miles away. Thanks for taking me back!!! Do we have to grind the onion, tomato and spices to make the masala paste? Yes, you have to grind the sauteed onion-tomatoes-spices mixture. Wow, this is an awesome curry. With just regular ingredients it is so tasty dish!!! Really loved the dish, thanks for sharing!!!! so i just made the dish…it’s actually on low heat still cooking the chicken…but my sauce looks so light!!! i used red onions and cooked them well…even put the tomatoes and everything!!! did i not cook the onions enough? i didnt want them to burn! Just cook the onions till they are not raw anymore. Don’t worry about the color of the sauce. wow, pics are awesum. i havent tried the recipe yet but im thinking of making it for my uncle who just came back from college. my parents are indian so i have a natural talent for making the BEST food in the world. (im a huge fan of butter chicken) lol 🙂 im only 14 but ive been cooking since i was 10. Sailu, you are my true inspiration. hello, may I use your chicken masala image (only) for a website I am building for a butcher (he sells curry sauces too, but we only need the image). I will acknowledge the image with a link to your page. I will not use the image if you do not agree. Can you email me at sailusfood[at]gmail[com]? a great yummy looking curry!!!!!! Hi, I looked at the pic of this chicken masala and thought I just HAVE to make that…and I did!!! What a hit..My husband was bowled over..but most importantly I LOVED IT. This will make an appearance pretty often in my household. Thanks a ton. I made this last night. And it was absolutely delicious..
We cooked this curry last week and it was very nice. In fact, it tasted better than the stuff we had eaten in restaurants. Thanks a lot for the wonderful recipe. The only difference we made to the recipe was we added a few green chillies at the end to make it hot. Our mother is your big fan and keeps making recipes from your blog. This curry was awesome!! sooo delicious. This has become one of our family favourites. I was just browsing for some chicken curry and was so tempted with the pic u had posted…prepared it last nite and it was sooper hit at home !! My hubby on a strict diet usually…freaked out on the curry with idlis…. Hi Sailu, maybe I’m just a bit thick but could you tell me what curd is, as I see it in a lot of recipes, but dont know what it is. thanks, Robert. As i have a stock of chicken in my fridge and we are not supposed to eat non-veg from 7/05/09 to 17/05/09 as we are having some pooja I was just browsing for some spicy chicken curry and i was so tempted to see the picture of the chicken curry ,so i have already called my mom and asked her to marinate the chicken with chilli powder ,turmeric,salt and yogurt.and she has already done with it and i have taken a print out of your recipe. a small question can we add coconut paste and juice of half lemon even if we add curry leaves .please let me know as earlier as possible.how can i see your other recipe let me know your website please. I tried this and I wanted to thank you for posting this awesome recipe. My past chicken dishes have just been okay and nothing great. This one is the best I have made till now. One question, if I increase the quantity of chicken than do I increase the quantity of cashew accordingly? Or will it make the dish sweet? Happy to learn you liked the chicken curry. Appreciate your feedback. Adjust or increase according to the quantity of chicken used. Use cashew nuts sparingly. Yummy! I tried this and it came out very good. You can also look at a couple of my original Chicken Dry recipes from my kitchen. One is the Pepper Chicken dry and the other is the Spicy Chicken dry. Sailu, tried this recipe yesterday and we liked this dish! (Me, Hub, two kids) Its pretty flavorsome, first recipe using curry leaves powdered! Also would like to tell you that your curry leaves dry powder is quite a hit here, made it thrice already, also a neighbour made it as she simply loved it. Tks for sharing!! I am going to try this recipe, but I am confused as to why there seems to be so much sauce in the photo. Looking at the ingredients, there is not much liquid in there. I know the chicken will produce a certain amount of broth while cooking, and the tomato is responsible for some, but this doesn’t seem to account for the abundance of sauce I see in the photo. Where does all that liquid come from? I have updated the post, do add a cup of water if you want more gravy. Hey, I have been a regular visitor of your blog (sorry for not leaving any comments)…. I tried this recipe of yours yesterday after getting back home from work…. It came out just awesome…. Thanks for the recipe. I have also tried few other recipes from your site… Everything tastes superb…. Once again thnx for all these superduper recipes. Hi Sailu, I have been following yours and Mahanandi’s blog for some time now. Since my husband and three boys are confirmed Non-vegetarians I am so thankful for your recipes as trying something new always takes the drudge out of daily cooking! This chicken recipe was delicious, and dry roasting the curry leaves before powdering really added that extra subtle flavor! I tried “Spicy Chicken Masala Curry” today. It tasted good but the colour of the gravy didn’t come as shown in the pic. Although I put the ingredients as specified but mine turned out to be little blackish in colour. Please let me know, where did I went wrong. I have used home made turmeric pwd and home made chilli pwd (using Kashmiri chillis). Can you please help… I am so eager to try your recipe. I have to cook for 8-10 people with 4 pounds of chicken. So how to add the ingredients..should i double the quantity what you mentioned ..plz help me. Oh yes! That is a brilliant recipe! Thanks a bundle Sailu. I used almonds as I had no cashews – sacriledge probably but it seemed to balance fine. I LIKE TRYING OUT NEW CHICKEN CURRIES. I TRIED THIS ONE AND IT WAS TOO GOOD, SIMPLE TO MAKE AND VERY TASTY !!! KEEP UP THE GOOD WORK AND KEEP POSTING NEW ONES !!! ALL THE BEST !!! Sailu! Thank you for this (and all of the other) recipes. I was introduced to Indian food very recently and wanted to learn how to make delicious dishes at home instead of always going out to eat at restaurants. I’ve made this recipe twice so far, and it is amazing! My roommates have loved the dish both times I’ve made it, and the other students who live in my residence hall have come in to see what I was making that smelled so wonderful! Please continue posting recipes, they are fantastic! Your picture has been copied here rehansheik.blogspot.com/2009/09/kashmiri-chicken-curry.html. Just thought I’d let you know. Hi Sailu – your receipes are awesome !!! Can you please post a tasty receipe for Butter Chicken – pleeeeeeeese. I tried many recipes from your site. It never failed in taste and in quality also. Whenever I want to try a new recipe, the first hit is your site only. The good part is measurement of your ingrediants is always suits for my taste. Thankyou for your wonderful service in the food blog world. I stumbled on this recipe by pure luck and decided to try it…it came out AMAZING…I have added a link to your recipe on my blog..thanks so much!! You have an awesome website..keep up the good work! just now only i checked ur website. I got chicken masala curry recipe. Today definitely i will make this & get back u. This is a superb recipe. I prepared it yesterday and it come good. This will be added into my site. I stumbled on this recipe by pure luck and decided to try itâ€¦it came out AMAZINGâ€¦I have added a link to your recipe on my blog..thanks so much!! You have an awesome website..keep up the good work! I tried this recipe yesterday, of course I made few modifications I added coconut milk instead of water. I added cilantro too and it turned out fantastic. We tried this recipe today and it came out really well. Thanks for posting such an amazing recipe. just now i checked your website. its great, my husband needs variations in chicken. i saw spicy chicken masala curry and definitely i will try it and get back to u. This is a great recipe!!! I tried this today and it really came out well. Thanks for sharing this!!! i am 13 years old and i plan on cooking this tommorow!wish me luck.btw, whats (“)?u used it in 1” cinnamon.pls reply soonest.ty!and also, is cinnamon really required, or is there a substitute 4 it? I follow your blog quite regularly & have tried out many recipes. 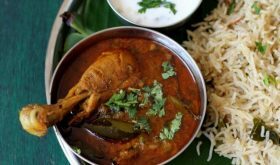 Today i was going thru a different site, I happen to see the image of the above chicken curry has been copied on this site ifood.tv/recipe/spicy_chicken_masala. If this site/blog also belongs to you, pl ignore my mail. Since i am a regular visitor & appreciate your work to a great extent, thought would let you know about this. Take care.. please try & put watermarks on all your images. Thanks for informing me, Anu. 🙂 Appreciate it. this is curry is one of my favorite currys ..i tried it twice and every body liked it so much in 2007.. i need to do it now again.its so kind of u to post all the recipes u relish.you love cooking so u have happy family. I tried this dish esterday. Thank you for a great recipe. My children told me “Mama its Awesome” So sailu the credit goes to you. Tried this one today. Tasted good but didn’t quite get the color. Will have to experiment some more. BTW, was browsing and found someone stole your photo. Check out the page below. I tried out this recipe yesterday and I loved it. And also its been explained very well, that made it very easy to cook. Thanks for this recipe.. I have tried this for the first time and guess what ” It’s incredibly delicious ” – Everyone loved it. Thanks for posting such a wonderful AP’s recipe – Simply Loved it – Thanks a heaps. Hats off to you for a fantabulous recipe! I tried this last week and it was one of the best chicken curries I’ve ever tasted..i swear..the only thing I changed was that I didn’t add much water since I wanted a thicker gravy and it was PERFECT!! AM planning on making this again for a potluck this Saturday! thanks..i’ve tried a bunch of your recipes and have never been disappointed! You make me love cooking 🙂 THANK YOU! Great going and hats off to the menu. But there is one thing which always makes me feel bad. We are losing the great level of taste over the generations. For example, still no one can make chicken like how my grandmother used to make with a country hen back in my village. That used to be coated with turmeric powder after we cut it and then the cleaning process is done and then cooked in a spicy way. We do not get good quality of meat, or good water, which all makes a fine dish. hii dear i tried ur dish today my husb liked it n graded 10/10.i need more and more recipes from u. Excellent recipe! Kudos to you on sharing it with the e-world! I’ve used this recipe twice and the result has been very satisfying. 1.I chopped the onion really fine (will try grating next time) & used tomato puree so I didnt have to cool & grind the fried masala. Hope this helps anyone looking to reduce cooking time & effort. I have tried the recipe today and it turned out to be very tasty. Thanks for the wonderful recipe. I live in Mumbai n Im from a veg family but My hubby isn’t. Im learing to cook chicken for him now only. I tried ur chicken curry y’day n he loved it so much.thanks a lots sailu garu… Im a regular visitor of ur blog but this is the 1st time i ever commented on ur recipe.its so yummy. delicious. Im so damn happy that he loved it. Thanks once again Sailu garu. Looks yummy! great pic too, mouth watering dish. I was trying to find a way to cook tasty chicken curry and I found your chicken recipe. I tried several ways to chicken tender, It never came to that soft, peeling form. I also like to know how to make mysoor dhal curry, which comes out creamy and pale and tasty. Can you help? 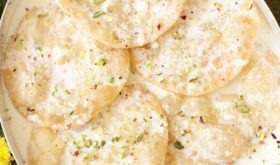 Hello Sailu – I am going try your recipe. Earlier I tried chicken curry with the help of other blogs and succeeded. Hopefully I will make a good dish. Also request you to please upload even vidoes that would be helpful. i’ve been looking for a simple chicken Curry recipes online but i couldnt find a simple one. they look dodgy, they tell you to add yoghurt. thanks to this one, it looks like a normal recipe and it looks good too. i haven’t made this yet but i will. its lovely thank you. and this is yellow in color others are white. thank you. I just tried your recipe and it tastes awesome. Thanks a ton for posting you recipe, I can’t wait for my husband to return from work and taste the chicken curry. OOOohhh, Cashew nuts..the secret to a fine curry. I love making my Chicken tikka masala from scratch and although I try to keep it healthy, a few cashew nuts wont hurt ;-). I tried this out over the weekend and it came out delicious. Your recipes are awesome, thanks for sharing! too much hard work nd too many dirty dishes! This is the best Italian I’ve ever had! You actually mean “garam masala”, don’t you? Coz I never heard anything of “ground masala” before. the past tense of grind is ground. ground masala means the masala which you kept for gRinding!! oh! Wow! I’d say you’re the “stupid superior know it all ” here ! even my mum knows how to cook better that! This recipe looks so good and I would love to make it but I am not understanding how to make all the different pastes. Also what are curds? And do you actually need curry leaves? Can you just use curry seasoning? If you read the recipe carefully: Step 2 is the cashew paste. Step 3 is seperate. Step 4 to 6 is ground masala. There are 3 things you make seperately. if you google “neera’s” indian spices. you will find a bunch of ones they sell. Putting the right amount of spices needed could make your Spicy Chicken Masala Curry perfect. This is great a dish that you could serve to your family. CAN YOU PLEASE LET US KNOW : WHAT ARE ”curds” ??? Excellent recipe! Followed every detail and result was absolutely wonderful! Everyone simple loved the curry. This recipe is absolutely amazing! We added raisins and bacon bits to the top as well. Fruit does so amazingly well on top of this wonderful dish. Next time we might try mango, saw that on another website. this is first time ive prepared chicken curry loved the taste thanks for a good recipe..plz let me know how to prepare kundelu pulusu also if u know glad to see a reply from you..
you are just superb. i tried this awesome recipe its great. delicious dish.love it. I just tried ur recipe this morning… It was unbelievably delicious! Very good recipe..tried it today came out well. I added a tsp of kasoori methi towards the end and it gave a wonderful twist to it! Thanks for sharing this! Can’t thank you enough for sharing this recipe. Absolutely love it! once in a while…try to eat out .. then you will understand what restaurants are serving as ” curry chicken” your look pathetic. Hi Sailu, This was the first curry I ever made- it was a big success! Thank you for sharing. I must admit I had to make a few tweaks due to lack of a few ingredients (mostly the curry leaves and not having a cinnamon stick). I thought I’d share some of my “notes” in case others came across the same roadblocks as I did. Best Chicken curry recipe EVER! Is red chilli powder Cayenne? Hi, is it required to boil chicken before any chicken recipe, be it fry or curry. I mean start with raw chicken or boil and then start? I tried this today…. My hubby loves it….. I made this curry (step by step – word for word) and it tasted just so rich creamy and so full of flavour. I’ll give you this-ppl could not stop talking about it after that:)..thank you so much for sharing–it is indeed a delight for home cooking for family and friends. This recipe is amazing… I did not have cashews but it still came out wonderful! I’m making it again tonight. Made this last night for dinner guests. It as awesome! I prepared according to the guidelines .. it taste awesome … Nicely explained .. thanks a lot . when does the Chicken go in??? No instructions. Hi amazing recipe….u saved my day of experimental flops …..thanks sailu perfect chicken curry except for the extra salt I added. Please if u don’t mind can u just include how much salt it will b useful for novice cooks like me. wen I asked my 3 year old daughter how is the chicken she was like its very tasty. Thanks a lot for me hearing these comments. what is cumin powder?? is it important? Cumin is zeera. If you do not have it, omit it. Yes, it is mildly spiced. For more spice, increase chili powder by another 1/2 tsp. I made this last week and it was absolutely delicious..making it again this week. well and cook till oil separates. Turn off heat. Cool and grind the cooked masala.” . Do I discard the oil? Thanks! It’s 1.5 T of oil in which you are frying a bunch of onions, ginger-garlic,tomatoes etc, I don’t think it will separate that much, maybe a few droplets will peek from the sides. You will not really be able to segregate the oil enough to discard ; so go ahead and include it in the paste. This was excellent! I made it twice so far and received rave reviews both times! First time I made it exactly the same as here. The second time I marinated with Sambhar powder (as suggested by a different blogger) instead of chili powder. Both times I made it for non-Indian guests. Tried this recipe on Sunday! Absolutely superb! Thanks for sharing! Please may I share the link to this recipe on my blog? Looks like a very easy method. Thank you. Can this be done without the cashewnut paste ???? Plz lemme know.. ! And also cant we combine the Dry spices with onion -tomato mix and grind together ??? Just tried it out… Easy and tasty!! Turned out very good! Thanks! How do you make chaswe and milk into paste? I made this dish and it turned out amazing. Hubby and kids loved it!! Planning to make it again.